I've struggled with my son keeping himself organized. His room quickly becomes a war zone and he rarely follows through or remembers where he places things. He lost his tooth box (the one I have had since a young girl) and when he and his sister both lost a tooth, before our dentist appointment yesterday, I told him to place it in the box that I'd used as a child. His sister put it in her box (see the picture attached). He apparently dropped his tooth on the floor in his room. 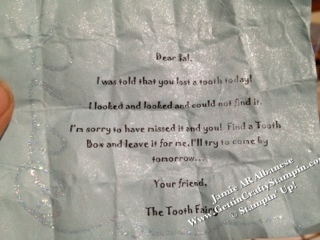 When my hubby and I couldn't find his tooth last night we created this note (see the blue attached note). 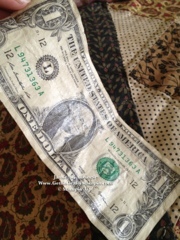 I was impressed with a post on Pintrest that encouraged spraying dollar bills with hair spray then sprinkling glitter. Iiiii thought that I could do better. 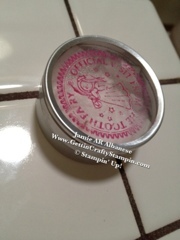 So with our Vanilla Smooch Spritz I sprayed the note and the dollar bills with a fine and lovely shimmery mist! 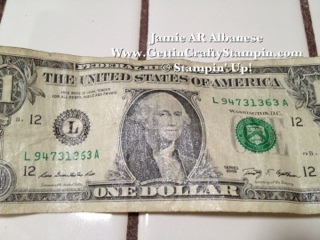 It was wayyyy less messy than most other ways and sheer enough to not take away from the actual dollar bill! Our daughter was excited to find her dollar bill, our son was upset to find this note. I located the missing tooth on his floor. 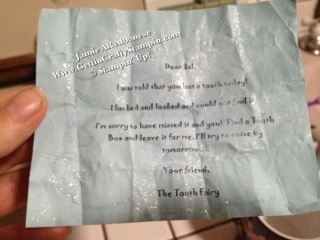 My daughter's box is a wedding favor box from Michaels and a retired stamp Tooth Fairy. Now to make him a masuline tooth box..... Hmmm.